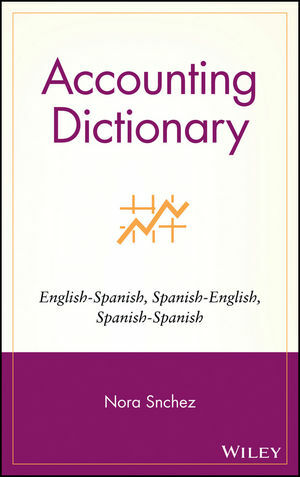 This bilingual Accounting Dictionary offers not only English–Spanish and Spanish–English translations of accounting terms but also a Spanish–Spanish section correlating the different terms used in major Spanish-speaking countries. The only accounting dictionary to offer such coverage, this useful reference provides accounting practitioners and students with easy, accurate guidance for translating in and among: Argentina * Chile * Colombia * Mexico * Spain * Venezuela. Ideal for translating financial statements, conducting audits, and performing accounting functions in multinational companies, Accounting Dictionary is an essential tool for all accountants, financial managers, and students participating in the burgeoning Spanish-speaking market. Nora Sánchez, CPA, is an established consultant and academic in Buenos Aires, Argentina. She teaches Corporate Valuation in the Master in Finance Program and Managerial Accounting in the MBA Program, both at Universidad Torcuato di Tella in Buenos Aires.